You may already know, but at the Google Reader's upheaval, I chose Fever as my new RSS service, as it is the only one that makes me the real owner of my content and sole person in charge for its longevity. I use Fluid to keep Fever on my desktop, but in the iOS, I'm amazed by a client called Ashes. My favorite RSS client at both devices is, definitely, Reeder, but since it has gone recluse to prepare its next version, I was a bit uneasy and decided to try Fever-only clients, I started with Sunstroke right before its redesign, which didn't please me much. Even though Sunstroke has great features, I got tired of looking at it every day. I went back to Reeder and remembered how I loved its simplicity as I swiped between articles. Still, I feared the anxiety that made me replace it in the first place and got my hands on another Fever-only reader, this time, Ashes. Ashes has a really interesting feature called Share Anywhere, which lets you call url schemes using parameters from Ashes. You can read the tutorial if you want, I wait. You can't simply type an action there as you'd do in Drafts or Launch Center Pro, you must install them from a link. So our first step will be creating an action at Drafts to send our written action to Ashes. But let's cut the crap and do something amazing, shall we? What about sending a quote from an article you're reading at Ashes to Drafts? I won't give you a link for the action right now, as an excuse to try the Action to Ashes action we added before. Paste this code on Drafts and run that action. What about some variation with Due? We'll send the blog title and url and create a new reminder with that information and return to Ashes after we're done. Opposite to some demonstrations shown in the documentation, I didn't manage to make [[[callback]]] work unless I also included the x-source=Ashes right before the callback parameters. Also, worth remembering that when you mark a reminder as done in Due and it contains an url, it gives you the option to open that link. But why stop there? Let's use Quotebook and store our favorite quotes from the articles we read every day with their sources and feed title as author. In case you're lazy, these are all the Ashes' actions listed in this article. 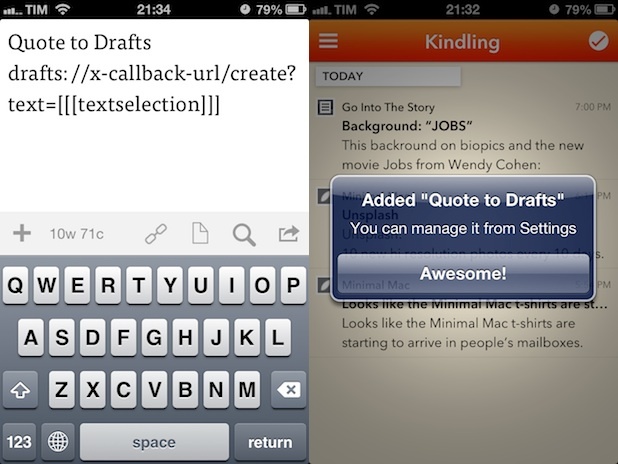 Quotebook it - Add a new quote with text selection, author as feed title and source as url. Now tell me, aren't you a little eager to get a Fever license just to have Ashes as your iPhone RSS reader?